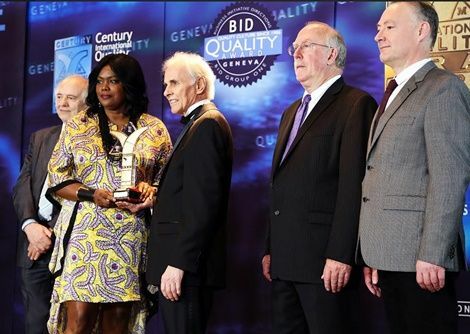 Ghana’s top Fashion College, Joyce Ababio College of Creative Design (JACCD) has won the prestigious Century International Quality ERA Award in Geneva. The International Award is in recognition of the College’s excellence in leadership and management, quality in teaching and learning, prestige of the brand and the overall growth of the College. The Award was received on behalf of the college in Geneva, Switzerland by Joyce Ababio, President, Founder, Fashion entrepreneur and Icon of the college. JACCD has over the past twenty years been a beacon of excellence, innovation and quality. It has provided state of the art training to students and has received a number of awards both locally and internationally. The college has been the number one choice for Fashion design training in Ghana and in the West African Sub region with students from Nigeria, Togo, Gambia, Senegal, Sierra Leone and Liberia. Joyce Ababio reiterated the College’s commitment to training the next generation of Top African Fashion Designers who can take the world by storm and change the face of the Billion dollar African Fashion Industry. JACCD has over the years trained some of Ghana’s top Fashion Designers who are now international household names. Designers such as Christie Brown, Brigitte Merki Ibrahim, Pistis, Agyepomaa and Rebekah Opuni graduated from the college. Century International Quality ERA Award Ceremony in Geneva is part of an annual program of BID Conventions. The objective of the ceremony is to recognize the prestige of outstanding companies, organizations and entrepreneurs around the globe. This year, the Award Ceremony took place at the InterContinental Genève, on March 19th and 20th. The Ceremony was attended by organizational leaders from diverse sectors from around the world. Recipients of the Century International Quality ERA represent a force in the business world, creating opportunities and reaching agreements with professionals from different countries and different continents. This international forum provides an ideal backdrop for business presentations through which commercial relations can be initiated, making the Quality Award a basis for new, mutually beneficial relationships.